that leads backstage in every theatre. 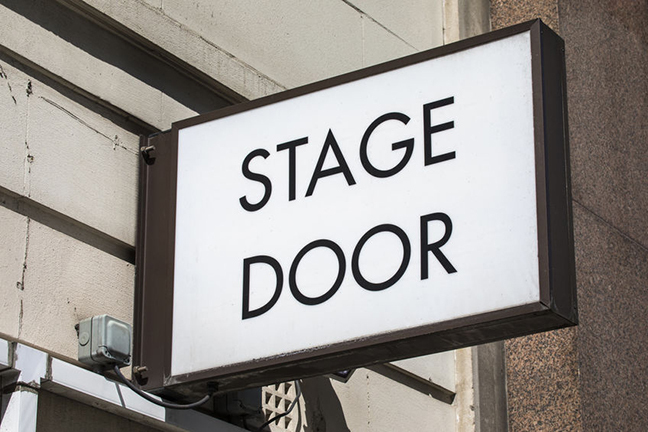 This separate entrance is reserved for the cast and crew, who make the magic happen. Without these pros doing their jobs backstage, the audience doesn’t get the experience they’re paying for out front. and as speakers, we can learn a lot from this. The Stage Manager “calls the cues” and is responsible for coordinating literally everything that happens. That means lights, sound, props, set changes, entrances, exits. The goal is to keep the audience seamlessly focused on one thing only: the finished product, the show. Even the simplest business presentations deserve a little theatrical pizzazz. Try to be aware, monitor and adapt as much as you reasonably can, to help your audiences gain the most benefit from what you’re saying. Watch for cues. Be aware of the dynamics in the room. Lift your head up from your material and key in to your listeners. Help them stay focused on your show. And then enjoy your three-star reviews! Be the happy recipient of more great tips and techniques, along with intelligent musings on the state of communications, by signing up for Diane Ripstein’s regular NewsNotes right here .